Published on December 25, 2011. Takes less than 1 minute to read. Count on me to tutor all willing in the art of programming. I let my younger brother play around with Visual Studio 2010 and provided the necessary tutoring. He managed to create his first ever program in about half an hour. Programming is not as much knowing the syntax of any particular programming language than it is creative problem solving. Visual Studio is a good example: anyone can drag and drop form elements to an empty canvas, but correct mindset is needed for them to actually form an useful and usable application. The same can be said for any other programming environment. I’ve discovered that I spend more time modelling, thinking and experimenting than I use for coding any particular feature. Download my brothers first WPF application from here (.exe, 16kb). 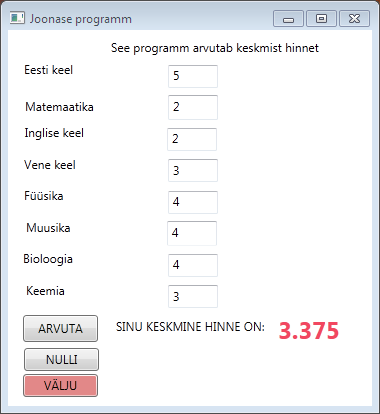 The program is an average grade calculator with subject names on the left and final marks on the right.